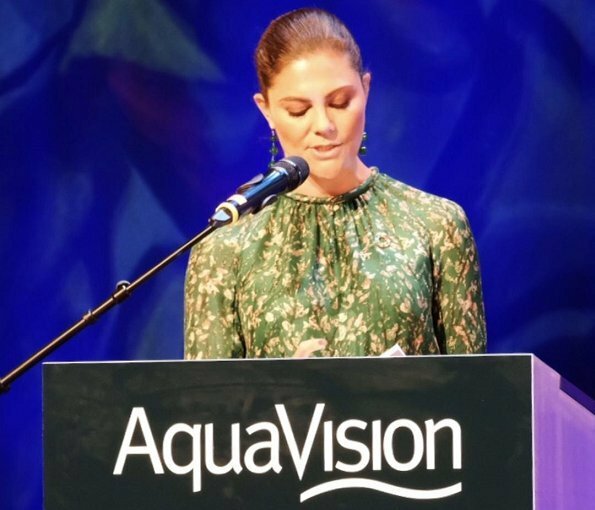 Crown Princess Victoria of Sweden attended AquaVision 2018 conference held in Stavanger. AquaVision is a world-class aquaculture conference. 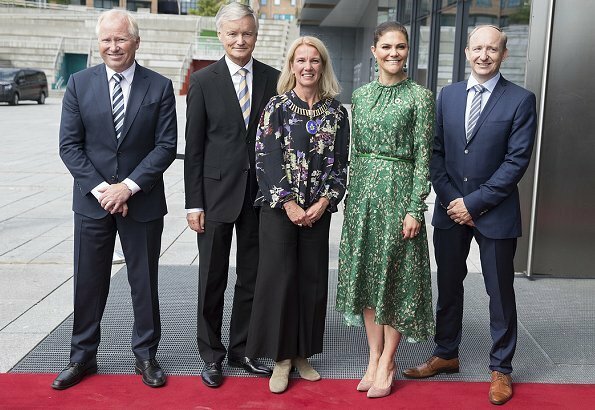 The Crown Princess gave a speech on “The Ocean Challenge and SeaBOS" at the conference. SeaBOS is a collaboration that marks the first time companies from Asia, Europe and US have joined together to stop overfishing, illegal catch and the use of slave labour in fisheries. Ich verneige mich vor dieser Kronprinzessin. Gestern noch in Skane heute in Stavanger in einer so wichtigen Sache. Rede halten (sie lernt sie auswendig) und dazu immer gut aussehen. Und das tut sie auch. Das Kleid steht ihr und die Farbe passt gut zu ihrem Teint. Die Haare sind gesund, gepflegt und hochgesteckt - so what.! Viel Erfolg für Aqua Vision und Danke für den Einsatz! A nother event Aqua Vision 2018,she is happy and looks great. I think the last time she wore this dress I didn't care so much for the shoes, these heels today go very well with the dress. I love her dedication to duty. Ah, the shiny almost wet-looking, algae-print, superlong-sleeve, frumpy floaty mididress with wonky hem again. At least not the green shoes this time. LOL. And a high, tight, prissy neckline too (although we are spared a bow...). Lovely! This shade of green is very, very flattering on Victoria, she looks radiant. 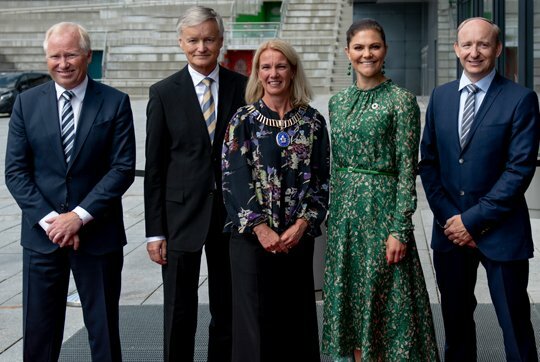 All these dresses make Victoria look 10 years older. This is absolutely not her kind of fashion! "not her kind of fashion" I wonder what you mean : the one she particularly likes OR the one which suits her best?? Anyway I think Victoria should be considered on a different basis; rather as a highly motivated person, for whom fashion and styling are no essentials. She puts priorities elsewhere, at a higher level. Only very exclusive occasions are given full attention to styling for hair and clothing. And honestly that dress is nor that bad : sleeves are quite long, I don't see any problem with that. I am not a big fan of floral dresses but this year they were in all collections, and they look a bit "vintage" for most ladies wearing them. It is true that it would good to compensate vintage in clothing by a trendy hair style. El vestido es feo y no le sienta bien. Victoria sigue insistiendo con H&M, pero rara vez aciertan con ella. Nice appearance - I like the green and the shoes pair well with this. 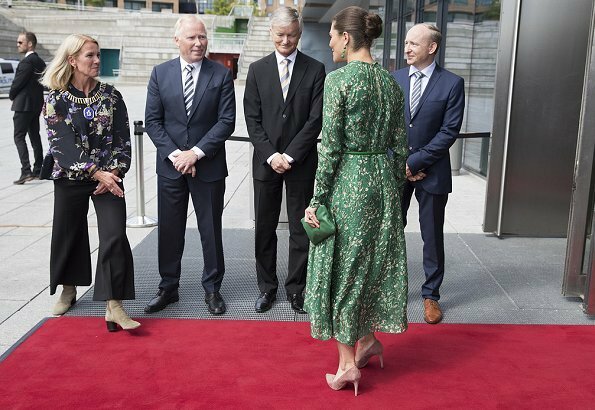 Princess Victoria of Sweden looks fabulous. Ugly bun once again, the dress doesn't fit her well , I like the color but not the print, and the length is weird. It makes her look older, sorry. I prefer the look of the other woman in the first three pictures. It is more interesting and creative with the silver necklace and boots.